The Nano-inXider provides structural information on nanomaterials using X-rays. With its vertical architecture and since all facilities are fully integrated within the equipment body, the Nano-inXider features the smallest footprint on the market for SAXS/WAXS systems - less than 1 m²! The equipment presents a very elegant design. Its refined silhouette and low number of switches reflect its ease of use while technological precision is emphasized by the purity of its lines, angles and shape. 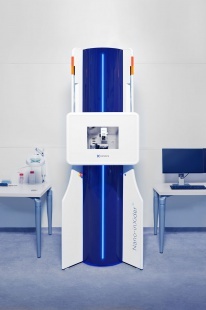 Your eye is automatically drawn to the very large central test chamber, the design of which is very innovative : the center frame lifts smoothly giving access to a large chamber volume designed like a showcase with optimal sample illumination. Instant information on the instrument status is provided by the integrated color lighting. The modular design of the system helps reducing the environmental cost impact.